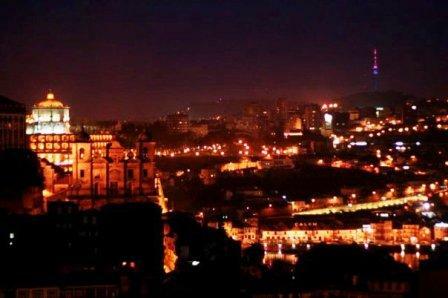 It was almost midnight when we arrived in our first Portuguese city. The chipper-chatters stopped abruptly as the escalator brought them away from the metro and up to the city. As the first sights of Porto came before our eyes, gasps of amazement and squeals of wow escaped our lips. Sao Bento’s casas, bathed in the golden ray of lamp posts strewn across the street, welcomed us not only to another country but another era. "Quiet nights of quiet stars..."
An era when fedora hats, trench coats and big wooden umbrellas that double functions as walking sticks are the fashion du jour. The people of Oporto, its name in the native tongue, were elegant and lived life in a relaxed pace. The pastelaries all around the city were always full with people who stood in the bar sipping fragrant coffee from little espresso ceramic cups over a plate of enticing pastries. During my three days in the city, I always saw the same old man standing in front the pastelarie around the corner from our hostel. He stood under the red-and-yellow awning in his grey trench and leather shoes, with navy tie and indigo beret over his sleeked silver hair, resting on his big wooden umbrella and a pipe in the corner of his mouth. It was like living the word ‘vintage’. "... quiet chords from my guitar..."
The people and casas were not the only things vintage in this place. 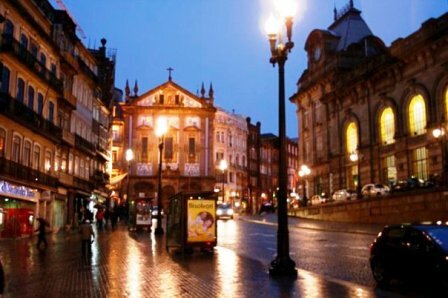 Porto is the city that lends its name to wine, where the world-famous Port wine originated from. We spent an afternoon touring one of the wine cellars across the Douro river, listening to the art of winery amidst giant oak barrels where the wine matures – and even went into one of them to feel what it was like being a wine. 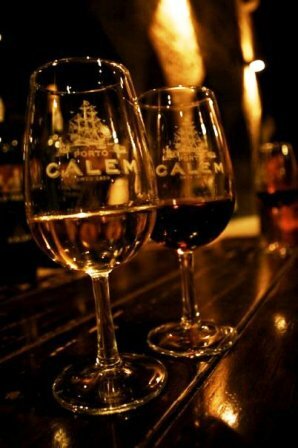 We learnt that port wine has three types: white, ruby, and tawny; we learnt that ruby and tawny are great dessert wines while the white suits better as an appetizer. We were offered two flutes of tawny and white Port to be enjoyed at our leisure at the end of the tour, which we sipped in style. Indeed, we tasted the wine like pros. We twirled the flute, inhaled the scent and uttered adjectives like ‘woodsy’ or ‘bouquet’, gurgled until every spot in our mouth were caressed by the wine – but we didn’t spit it out like what the pros are supposed to do. The Port was too good, even I, the ultimate alcohol despiser, loved it and drained the whole two flutes. 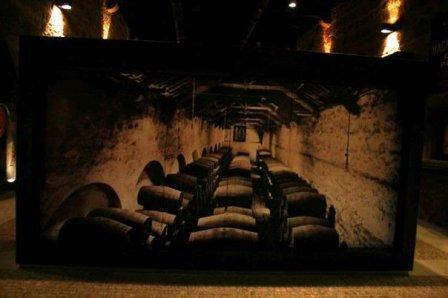 Of course, later on I also found out that under the deceptive sweetness of the Port lies 20% alcohol. "... floating on the silence that surrounds us ..."
"... quiet thoughts and quiet dreams ..."
Thank goodness that walking around the hilly city, under the stars and golden city lights, was a perfect remedy to post-wine lightheadedness. Across the row of wine cellars were a street full of restaurants, touristy but offers local delicacies like the lovely dessert called the Camel Spit. Sailboats were parked along the river, looking pretty and deserted. 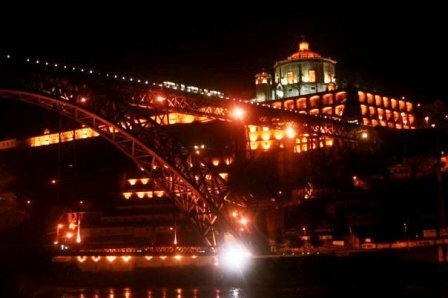 But go further from the tourist spot up to the little alleys going up and down Porto and you will still be enchanted by how the lights accentuate the city’s most mundane features. 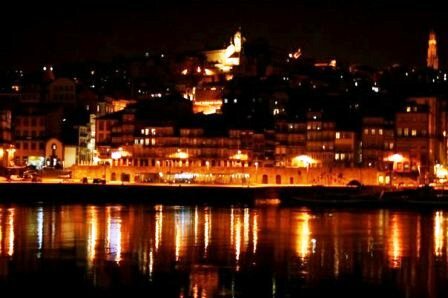 Porto was indeed a night city; it was pretty by day but simply stunning at night. We came in winter when tourists were few, so our moments bonding with the city were private. "... quiet walks by quiet streams ..."
"... and the window looking to Corcovado ..."
As I navigated around Porto, the song Corcovado by Antonio Carlos Jobim came into my head. 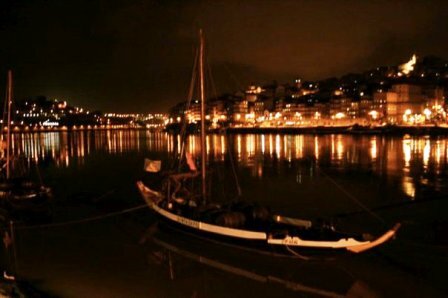 The bossa nova tune, known better in its English version ‘Quiet Night of Quiet Stars’, spoke about the most famous mountain in Brazil but embodies Porto’s feel so well that walking around the city felt like living the song. Like Corcovado, Porto was timeless, serene, and romantic; it was song of dreams and it was a city for dreamers. Go and listen to the song – that was how Porto felt like for me. Close your eyes, you might just be able to feel the cobbles of Porto under your feet. P.S. : the Portugal trip continued to Lisbon! porto is beautiful. your entry makes me feel bad that i was not able to find a way to go there. bummer. but there is always a lifetime ahead, noh? looking forward to more of your travel stories. i found your new travel blog and tried to drop a comment there, but it didn’t show up. very cool, can’t wait to see if one day we’ll write about the same place! how strange. it’s supposed to come out as a pop out window. hopefully, we travel somewhere together too!